Bird's eye view of Kampala City, Uganda. 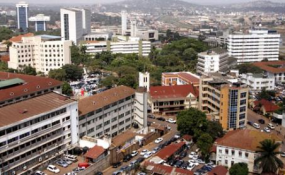 All buildings in Kampala will be listed to ease revenue collection (file photo). Uganda's current account deficit rose by $732 million to $1.74 billion in the year ending October 2018, compared with the same period in 2017, attributed to sharp increase in government and private sector imports. The current account is an economic indicator that tracks changes in the value of imports and exports registered by a country. An excess in the value of imports against exports implies a current account deficit. This translates into higher expenditure incurred on imported goods and services compared with income earned from exports. A rising current account deficit usually compels governments to withdraw cash from their foreign reserves in order to pay for imported items or to borrow money to clear import bills. The Bank of Uganda has said that fuel, industrial equipment, chemicals and motor vehicles contributed the lion's share of private sector imports in the 12-month period under review, but their impact on economic growth remains unclear. In contrast, essential drugs procured by the National Drug Authority and machinery to execute various road projects accounted for the bulk of government imports, though verified procurement figures were not available by press time. BoU data shows that the country's import bill had risen by $829 million to $5.733 billion by close of October 2018. Exports grew by $138 million, supported by improved weather conditions in major crop production zones. The trade deficit expanded by $514 million to $2.095 billion during the same period. In comparison, the current account deficit stood at $329.28 million in the fourth quarter of 2017. It increased to $368.31 million in the first quarter of 2018, expanding to $615.61 million between April and June. The deficit surged to $764.92 million in the third quarter of 2018. Growing import volumes boosted tax revenues between October 2017 and October 2018. Total international trade taxes amounted to Ush610.2 billion ($162.7 million) in August against a target of Ush542 billion ($144.6 million). This translated into a surplus of Ush67.8 billion ($18 million), according to Uganda Revenue Authority performance reports. Excise duty charged on petroleum products generated Ush165.2 billion ($44 million) against a target of Ush161.5 billion ($43 million) during the same period. Withholding tax levied on imports raised Ush16.9 billion ($4.5 million) against a target of Ush14.7 billion ($3.9 million). Total Customs tax revenues amounted to Ush571.6 billion ($152 million) in November 2018 compared with Ush533.8 billion ($142 million) recorded in November 2017. But this segment registered a collection deficit of Ush22.6 billion ($6 million) in November 2018, against a target of Ush594.2 billion ($158 million), URA data indicates. "Fuel imports were the top contributors to the import bill mainly because of a surge in international oil prices, with a barrel of crude oil rising to $60.Though the higher import bill helped stimulate growth in import taxes, Customs revenues and domestic taxes failed to meet collection targets, " said Kenneth Egesa, a director at BoUs financial stability department. The shilling on the other hand gained by 0.9 per cent against the US dollar in November, exchanging at Ush3,740. This was attributed to the peak of the coffee export season in October, plus significant dollar inflows from offshore investors. Foreign currency demand among big corporates and some small businesses that sell household products like interior decorations has increased steadily. There have been more frequent currency conversion transactions of $500,000 to cater for import orders," said Charles Katongole, an executive principal in charge of financial markets and Treasury operations at the Standard Chartered Bank Uganda. But Dr Fred Muhumuza, an economist warned that temporary declines in the current account deficit could put pressure on the shilling and hurt the exchange rate.